Background: The current burden of adult congenital cardiac disease is on the rise. Although there have been advances in their management and patient care, there is still dearth of establishing clinical preventive strategies and risk stratification in these patients. Aims and Objectives: The primary objective was to study the prevalence and pattern of adult congenital cardiac disease presenting to a tertiary care center in the state of Uttarakhand, a predominantly hilly state with sparse health-care facilities. The secondary objective was to assess the demographic, metabolic parameters and risk factors of patients with adult congenital cardiac disease. Materials and Methods: All adult patients of >16 years of age presenting at outpatient and inpatient department of internal medicine over a period of 5 years from July 2008 to June 2013 were thoroughly examined. The suspected patients of congenital cardiac disease were screened using electrocardiogram (ECG), echocardiography, and chest X-ray. Detailed demographic and metabolic parameters were compiled of each patient suffering from adult congenital cardiac disease. Psychiatric assessment of each patient was done to rule out generalized anxiety disorders. Results: A total of 2,194,000 participants attended Medicine Department over a period of 5 years from July 2008 to June 2013. Two hundred and forty patients were diagnosed to have of adult congenital cardiac disease, of these 98 (40.8%) were males and 142 (59.1%) were females. The most common defect was atrial septal defect seen in 97 (40.4%) patients of adult congenital cardiac disease. Metabolic syndrome was more common in patients with complex adult congenital cardiac disease. Generalized anxiety disorders were found to be significantly associated with these patients. Conclusions: There are sparse data available on the prevalence of adult congenital cardiac disease, especially from the state of Uttarakhand. Such a study would be useful in formulating clinical services for early diagnosis as well as in assessing risk factors for the prevention for morbidity and mortality in these patients. This study reiterates the fact that early screening and detection of congenital cardiac disease in these patients can help in planning early medical and surgical correction of the disease. In the recent times, the survival of patients with more complex congenital cardiac disease is on the rise, leading to longer follow-up and dependent lifestyle in these patients. This could be attributed to the growing advancements in the field of pediatric and cardiovascular surgery. However, the current and future burden of the disease is still unknown as there is variation in age of presentation of these patients. Furthermore, inappropriate screening and notification of congenital cardiac diseases at birth have led to inadequate reporting of these cases., The current available data suggest that the overall prevalence of adult congenital cardiac disease is around 3000 per million. Regional, demographic, and socioeconomic differences play a pivotal role in assessing the incidence of the disease as well as its mortality and morbidity parameters. Besides biological, the disease also has socioeconomic impact on the adults affecting their quality of life. Moreover, patients with complications of the disease such as arrhythmias and pulmonary hypertension may present the need for recurrent surgery. The need for recurrent and regular health checkups lead to increased economic burden on these patients. These socioeconomic parameters in combination are found tobe responsible for increased prevalence of depressive illness in these patients. Defects such as ventricular septal defect (VSD), bicuspid aortic valve, repaired atrial and ventricular septal effect, and patent ductus arteriosus are grouped as mild disorders. Moderate defects include tetralogy of Fallot, bicuspid aortic valve with stenosis and regurgitation, and atrioventricular canal defects. Complex defects include repaired transposition of great arteries, univentricular anatomy, pulmonary atresia, and cyanotic heart diseases. Cyanotic heart disease includes transposition of great arteries, double outlet ventricle, double inlet ventricle, truncus arteriosus, total anomalous pulmonary venous connection, VSD with Eissenmenger's syndrome, atrial septal defect (ASD) with Eissenmenger's syndrome, tetralogy of Fallot, and Ebstein anomaly. The data on the incidence and prevalence of congenital heart diseases are sparse from India and virtually nonexistent from Uttarakhand. In this study we categorized the adult congenital cardiac diseases as mild, moderate and severe subtypes. We compared the complexity of adult congenital cardiac disease with prevalence of psychiatric illnesses in these patients. All patients aged >16 years who attended the out and inpatient departments of Internal medicine of a tertiary care hospital of Uttarakhand, over a period of 5 years from July 2008 to June 2013 were included in the study. The patients who had symptoms of suspected cardiac disease were screened by electrocardiogram, chest X-ray, and echocardiography. Institutional Ethical clearance was sought and written and informed consent was obtained from all those screened. Detailed history, examination, demographic (literacy, employment, etc. ), and metabolic parameters were compiled in preformed questionnaire for all those suffering from congenital cardiac disease. The complexity of adult congenital cardiac disease was categorized using Bethesda conference classification. Comparisons were made between three groups – simple, moderate, and complex congenital cardiac diseases, so created. Metabolic syndrome was diagnosed as per the NCEP-ATP III definition. The Diagnostic and Statistical Manual of Mental Disorders 4th Edition criteria were used to diagnose patients with generalized anxiety disorder. Of the 219,400 patients screened, congenital cardiac disease was diagnosed in 240 patients (male: female = 49:71). Congenital cardiac disease was simple, moderate, and complex in 177 (73.7%), 24 (10%), and 39 (16.23%), respectively. [Table 1] shows the spectrum of congenital heart disease in relation to the age at diagnosis. Nearly 87 (50%) of patients with simple cardiac disease were literate, whereas only 12 (19%) patients with moderate-to-complex congenital cardiac disease were literate. Almost half of the patients with moderate-to-severe adult congenital cardiac disease were unemployed. Hypertension (n = 14, 22.2%), hyperglycemia (n = 27, 42.8%), and dyslipidemia (n = 24, 38%) were the main comorbidities, while metabolic syndrome was present in 36.5% cases of moderate-to-severe adult congenital cardiac disease patients. Due to the small number of patients with moderate congenital adult cardiac disease, this subgroup was merged into those with complex disease for comparison [Table 2]. Overall, 47.9% patients with moderate-to-severe adult congenital cardiac disease were found to have generalized anxiety disorder. 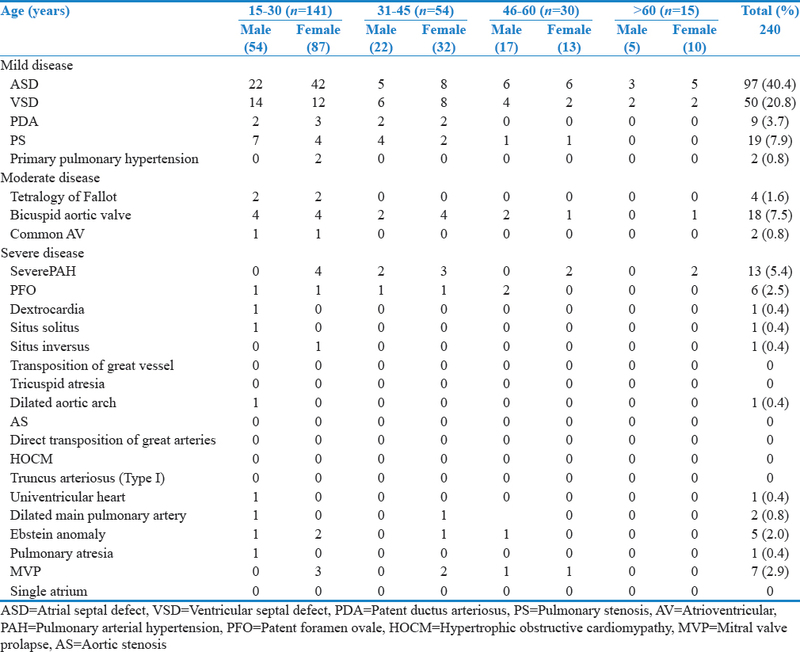 [Table 3] shows the prevalence of adult congenital cardiac disease in the studies conducted by Marelli et al., Billett et al., Daliento et al., Warnes et al., Vander Velde et al., Somerville et al.,, Hoffman et al., and Fredriksen et al. [Table 4] shows causes of admission and comorbidities in patients of adult congenital cardiac disease. Coronary artery disease was the most common comorbidity in patients with adult congenital cardiac disease found in 85 (35.4%) patients. Heart failure was found in 54 (22.5%) patients. Prevalence of adult congenital cardiac disease is variable in literature and global estimate is 0.3% of the world's population. Marelli et al., Billett et al., and Daliento et al. have suggested the prevalence ranging from 2000 to 4000 per million adults. Recent study from India by Bhardwaj et al. put the figure at approximately 2.4/1000 individuals. In our study, we found around 240 patients of adult congenital cardiac disease over a period of 5 years from July 2008 to June 2013. This variation in the prevalence rate could possibly be as a consequence of underreporting of such cases, inappropriate echocardiography reporting, geographical and regional variation, less severe cardiac disease, and lower limit of age considered for the present study. We screened only the symptomatic cases of adult congenital cardiac disease. Thus, there is underreporting of the subset of asymptomatic patients. Agarwal et al. reported simple lesions in 32.4%, complex lesions in 42.5%, while 25.1% lesions in their study were unclassified. On the contrary, in our study, simple lesions were found in 73% cases and the remaining had moderate-to-severe adult congenital cardiac disease. In the present study, ASD was the most common defect and clearly had female preponderance. Earlier studies have also highlighted female preponderance of diseases such as atrial septal defect, mitral valve prolapse, patent ductus arteriosus, and common atrium A minority (19%) of the cases of moderate to severe adult congenital cardiac disease were found to be literate. Nearly 50% patients of this group were unemployed. Almost half of the patients with complex adult congenital cardiac disease had generalized anxiety disorder. Similarly, previous studies have observed that at least 50% of the interviewed adult patients with complex adult congenital cardiac disease were fulfilling the criteria of mood and anxiety disorder. Thus, neuropsychiatric evaluation in these patients should be encouraged. It has been observed that the reasons behind depressive symptoms in these patients are overprotective family members, increased dependence on family members, and deterioration of quality of life. Metabolic parameters – Deen et al. demonstrated that the presence of metabolic syndrome is significantly associated with adult congenital cardiac disease. Metabolic parameters such as hypertension, raised blood sugar, obesity, and dyslipidemia were more prevalent in patients with moderate/severe cardiac disease in the current study. Furthermore, metabolic syndrome was significantly associated with moderate/severe cardiac disease compared to simple disease. This was in accordance to our study. Comorbidities in the form of arrhythmias, renal failure, and pulmonary hypertension occur very commonly in these patients. Previous studies have documented that patients with adult congenital cardiac disease with heart failure are at thrice the risk of mortality as opposed to patients without heart failure. It has also been observed that the rate of coronary artery disease in patients with admitted adult congenital cardiac disease is more as compared to young adults without adult congenital cardiac disease. The prevalence of congenital cardiac disease, although low, may be grossly underreported from the state of Uttarakhand. Sparse and inaccessible health-care facilities, lack of awareness, low literacy, poor socioeconomic status of those affected, and association of comorbidities make the diagnosis of these remediable cardiac defects difficult. Late diagnosis and/or lack of resources (bothmedical/surgical and financial) further worsen the quality of life of those affected. Moreover, significant association of anxiety disorders in these individuals call for an integrated approach involving evaluation of their psychosocial status as well as clinical parameters. Wren C, O'Sullivan JJ. Survival with congenital heart disease and need for follow up in adult life. Heart 2001;85:438-43. Warnes CA, Liberthson R, Danielson GK, Dore A, Harris L, Hoffman JI, et al. Task force 1: The changing profile of congenital heart disease in adult life. J Am Coll Cardiol 2001;37:1170-5. Mulder BJ. Epidemiology of adult congenital heart disease: Demographic variations worldwide. Neth Heart J 2012;20:505-8. Marelli AJ, Mackie AS, Ionescu-Ittu R, Rahme E, Pilote L. Congenital heart disease in the general population: Changing prevalence and age distribution. Circulation 2007;115:163-72. Kovacs AH, Saidi AS, Kuhl EA, Sears SF, Silversides C, Harrison JL, et al. Depression and anxiety in adult congenital heart disease: Predictors and prevalence. Int J Cardiol 2009;137:158-64. Wu JC, Child JS. Common congenital heart disorders in adults. Curr Probl Cardiol 2004;29:641-700. Webb GD, Williams RG. 32nd Bethesda Conference: “Care of the adult with congenital heart disease” 1. J Am Coll Cardiol 2001;37:1162-5. Huang PL. A comprehensive definition for metabolic syndrome. Dis Model Mech 2009;2:231-7. Barton S, Karner C, Salih F, Baldwin DS, Edwards SJ. Clinical effectiveness of interventions for treatment-resistant anxiety in older people: A systematic review. Health Technol Assess 2014;18:1-59, v-vi. Billett J, Cowie MR, Gatzoulis MA, Vonder Muhll IF, Majeed A. Comorbidity, healthcare utilisation and process of care measures in patients with congenital heart disease in the UK: Cross-sectional, population-based study with case-control analysis. Heart 2008;94:1194-9. Daliento L, Cecchetto A, Bagato F, Dal Bianco L. A new view on congenital heart disease: Clinical burden prevision of changing patients. J Cardiovasc Med (Hagerstown) 2011;12:487-92.
van der Velde ET, Vriend JW, Mannens MM, Uiterwaal CS, Brand R, Mulder BJ, et al. CONCOR, an initiative towards a national registry and DNA-bank of patients with congenital heart disease in the Netherlands: Rationale, design, and first results. Eur J Epidemiol 2005;20:549-57. Somerville J, Cumper M, Deanfield J, Hillis S, Hunter S, Shore D, et al. Grown-up congenital heart (GUCH) disease: current needs and provision of service for adolescents and adults with congenital heart disease in the UK. British Cardiac Society. 2002;88 Suppl 1:i1-14. Hoffman JI, Kaplan S, Liberthson RR. Prevalence of congenital heart disease. Am Heart J 2004;147:425-39. Fredriksen PM, Roislien J, Thaulow E. The estimated number of patients with adult congenital heart defects in Norway. Scand J Med Sci Sports 2008;18:520-5. Bhardwaj R, Rai SK, Yadav AK, Lakhotia S, Agrawal D, Kumar A, et al. Epidemiology of congenital heart disease in India. Congenit Heart Dis 2015;10:437-46. Agarwal S, Sud K, Khera S, Kolte D, Fonarow GC, Panza JA, et al. Trends in the burden of adult congenital heart disease in US emergency departments. Clin Cardiol 2016;39:391-8. Perloff JK. Congenital heart disease in adults. A new cardiovascular subspecialty. Circulation 1991;84:1881-90. Deen JF, Krieger EV, Slee AE, Arslan A, Arterburn D, Stout KK, et al. Metabolic syndrome in adults with congenital heart disease. J Am Heart Assoc 2016;5. pii: e001132. Moodie D. Adult congenital heart disease: Past, present, and future. Tex Heart Inst J 2011;38:705-6.